We are disappointed to announce that the ski race has been cancelled. We did not have sufficient registration to make the event viable. We are most grateful for all the teams and sponsors that agreed to participate in the event. We are committed to try again in 2016. If you are interested in assisting to make next year's event successful, please contact us. Finger Lakes Regional Burn Association has resurrected the Annual Western New York's Fireman's Hose Race! 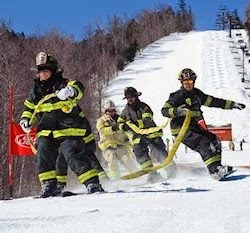 This event will be held March 7, 2015 at Swain Ski Resort. ALL proceeds to benefit the FLRBA, not-for-profit 501c3 organization dedicated to increase awareness to burn-related issues and helping burn survivors medically, financially, and emotionally. Open to Career, Volunteers and Explorers. can register after submitting $225/team. Buy Now below, then come back here to submit your roster and t-shirt sizes. This will be held during Swain's Annual Spring Carnival with plenty of fun, food and music all day long.